Believe It or Not- Your employees want to be engaged and you can make it happen! You can’t force a person to be driven to succeed. You can only provide an environment at work that is conducive to and supportive of employees choosing to become success-driven at work. To encourage employees, we must understand the inherent motivational triggers and then design programs to reward and support them. It is YOUR actions in the workplace that either encourage positive behavior or discourage employees. One way to achieve this is through incentivizing behavior and performance based on accurate data. A recent American Laundry News article states “Data is a topic that many in our industry are still lacking to grasp and efficiently make use of”. The article goes on the say that data will and should play a significant role in all aspects of your plant operation. This is especially true for performance being able to accurately measure your employees' productivity provides critical insight into how skilled, engaged and productive your employees really are. Using monitoring tools that provide real-time performance data, such as Spindle Operations Management Software, that can accurately measure employee performance allowing for you to provide on-the spot positive feedback and even an unexpected incentive promoting their engagement. So, How do I start creating this positive environment? Is it identifying a cost savings opportunity? Is it being nimble to the ever-changing customer demands of your operations? Do you have an employee that set a new company record? Think about actions or behaviors that not only create an impact on your business, but will also help instill a sense of pride and accomplishment within your employees. Employees want to know exactly what you expect from them. When they have the reassurance of clear direction, motivating employees with incentives becomes easier because there is now a framework for their expected performance. Step 2: Decide how to reward these important behaviors and performance. BE CREATIVE! An Incentive program can help to re-enforce the positive workplace atmosphere, but incentives don’t need to stop at money. In fact, while monetary rewards are a great option, they can make a short-lived impact on engaging employees, become expensive, and may not override their negative feelings of their workplace environment. This list from Forbes provides 25 low-cost ways to reward employees, including ideas like posting a thank you sign in the lobby with their name on it or arranging upper management to stop by and personally thank them. 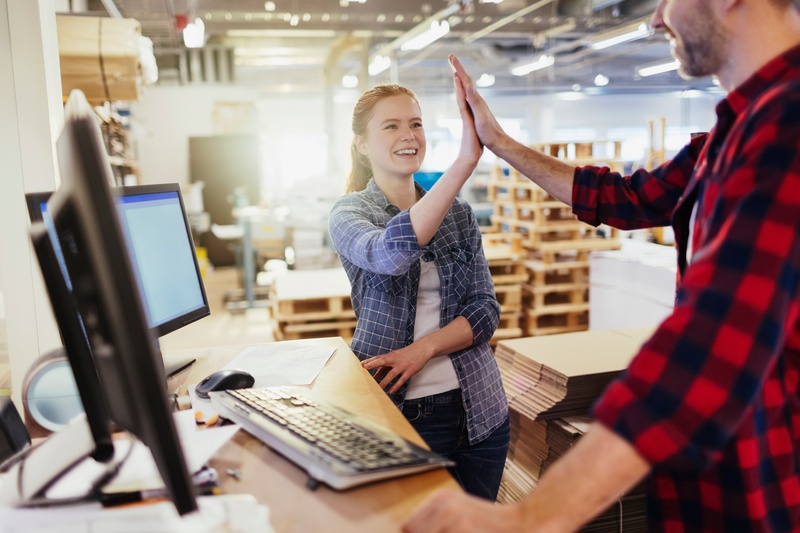 Low-Cost rewards can be a more sustainable option for your commercial laundry operation and can create opportunities to give a more personalized experience for every productive employee. Addressing longer-term recognition and sustained communication with clear direction helps contribute toward employee satisfaction. Step 3: Time to communicate! Now that you have decided on behavior and performance expectations, it is time to communicate them to your employees. The easiest way to accomplish this is with data, specifically real-time and visual data. A visual scoreboard with productivity alerts allowing employees to see how they're doing and push themselves to hit the goals you set and achieve the recognition they deserve. To learn how Spindle can help synthesize your raw data it into actionable insights watch our video. Also, Be sure to subscribe to our knowledge center to receive the latest news and updates for the laundry industry.